I love carbs and stodge. There it is, I’ve said it. Very un-PC of me, I know. 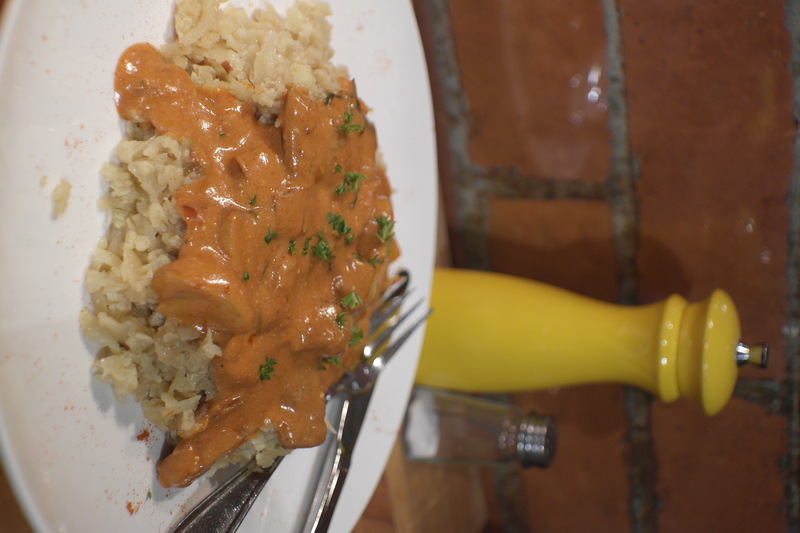 Bread, potatoes (including hot chips), crackers, kumara, couscous, pasta, rice… Oh yes, rice. I love all stodge: It makes my heart sing. Unfortunately stodge also make my bum large and my jeans shrink. Don’t worry, this isn’t another blog post where I’m going to rant about my weight and vow to drop to a size 10 before spring (and subsequently commence blogging my weight loss journey and exercise regime). I am a curvy girl, I happen to like most of my curves, I just wish last winter’s jeans fit – and dammit, they will be worn again someday soon! So why have my jeans shrunk? Simple case of more ‘input than output’. I take responsibility – I know my love of stodge is partly to blame! Hang on, I can hear you thinking, where do carbs and shrinking jeans fit in with a recipe for Cauliflower Rice? That’s easy! I’ve been trying to cut down on carbs (particularly at night time) in a quest to reclaim my shrinking jeans. Being a lover of pasta and meat in a sauce, I was really struggling with relinquishing these, but then my Aunty Angie, who has lost a truckload of weight recently, asked me if I’d tried “cauliflower rice” as she partly attributes her weight-loss to knocking carbs on the head at dinner time. That was enough to motivate me to go and buy a cauliflower and get in the kitchen and started playing. It turns out that I might have been living under a rock: I’ve since been hearing about cauliflower in the place of rice/couscous everywhere! It’s hugely popular with the Paleo way of eating. Anyhow, I’m now really happy to share with you this gem of a recipe that has seen us eating, with gusto, this guilt-free rice-like substitute. Cauliflower rice is easy, delicious and, importantly, it’s a great way to consume more veges and add bulk and density to a dish, without the calories. I hope you enjoy! Ideally you need a food processor to prepare the cauliflower, but you can get the job done with a grater – I do (I still haven’t replaced my food processor). A grater will just take longer and make a bit more mess. I’ve tried several different ways of cooking the cauliflower, including nuking in a covered dish in the microwave without any liquid, but I reckon the recipe below is the best method, hands down. 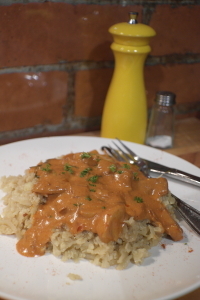 We’ve had this in the place of rice or potatoes with beef stroganoff, under casseroles, even to accompany Thai curries or stirfries. It’s super Weight Watchers friendly too – I wish I’d known about this back in the day of point counting. Cut the cauliflower into florets, discard the core. 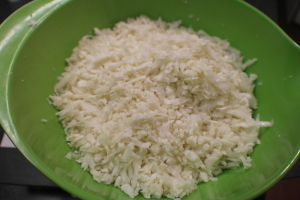 Grate the cauliflower by hand, or, better still, pop the florets into the bowl of a food processor (you may need to do half a batch at a time depending on the size of your food processor bowl) and blitz until the cauliflower has a rice grain look about it. Tip: If you are using a food processor, be careful not to over-blitz it: It’ll turn to mush. You want it to kind of look like rice! Take a large frying pan, ideally one with high sides. Heat 1 tablespoon of olive oil or rice bran oil. When the oil is hot, add the onion (and garlic if using) and saute gently for approximately 7 minutes or until it’s lightly golden. 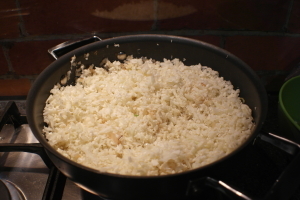 Add the cauliflower and stock, stirring for 4-5 minutes until the ‘grains’ of cauliflower are tender. Season well. When cooked remove from heat and top with your favourite curry / stirfry / casserole / pasta sauce. Enjoy! Add 1/4 cup of your favourite herb (parsley/thyme, basil, chives) to the pan at the same time you add your cauliflower. Make a rice salad: After the cauliflower has cooled, add your favourite vegetables (tomato, cucumber, chopped spring onion), add your favourite nuts and dressing. Yum! 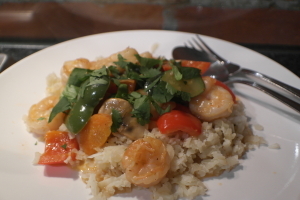 Delicious with a cream Thai curry! 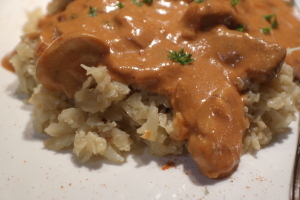 A close up of Beef Stroganoff served with cauliflower rice. Roasted Cabbage Recipe – Better than it sounds!